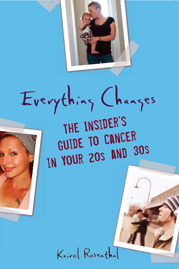 Everything Changes – The Guide to Young Adult Cancer » Tips for Visiting Someone Who’s Sick? Three days after I got home from the hospital I had 8 people descend on my little condo to clean. Originally it was supposed to be just two, but more people from my church wanted to help. They cleaned out my fridge without telling me and threw out almost all my food. The fridge looked like I had just moved in. I know they were trying to help, but it was very overwhelming. After my second surgery I told my friends I did not want any visitors at the hospital and none while I was staying at my parents the first week. I really wanted time to recover and did not want people to see me at my worst. Unfortunately a few close friends did not heed this request and came to visit anyway. I do have a great group of friends and came to rely on their help with laundry, meals, changing the bed etc. I became very good at “kicking” people out when their visit ran too long and I needed to rest. One thing I learned is people really want to help and it is best to tell them exactly what you need them to do. Otherwise they will do what they think you need and it is not always helpful. After a while I came of a list of guideline for my visitors of what was helpful for them to do and say and told them what type of things they might say that was hurtful. For example, I asked people not to tell me how good I looked, that they were praying for a miracle, that everything would be ok and that I should keep fighting. While these things were meant to cheer me up, they ended of hurting my feelings. I found that I had to specifically ask people to talk about what was going on “in real life.” And that they didn’t have to qualify everything with “It’s not as bad as what you’re going through, but…” I really just wanted normal conversations. Sometimes that included talking about what was going on with me, and sometimes it didn’t. You got a flat tire on the way to work? That stinks! Would you tell me about it if I wasn’t in a hospital bed? Then tell me about. I think visitors should be advised to ask and not assume. Ask me if I want to hear about your life, I may need a diversion from my pain but I may not want to be exposed to your drama. Ask if I would like for you to stay longer, don’t excuse yourself with “I know you need to rest.” maybe I need company right now. Ask if you can help, only when you are prepared to follow through. If you offer and I accept, I am counting on you. Thank you so much for writing this! I’ve found so many who want to visit when I’m in the hospital and not up for visitors and then nobody who really wants to help when I’m home. It’s been difficult to communicate, but there are a few close friends who have always been there when I want them but cool enough to understand when I kick them out. I also love what Heather said. I definitely want the friendship to be mutual. Sure, what’s going on with you may not seem to be as bad as cancer, but that doesn’t mean that I don’t care and/or want to know. It’s a hard balance to find, at times, both for me and for friends. It can be different every day, so it never hurts to call and double-check any plans just before it happens and not be offended if I cancel. What I’ve appreciated most are the friends who aren’t afraid to let things be silent and be just a loving presence there for me to know I’m not alone as well as those who are on top of things enough to know when I’m tired, when I need something to eat, when chores need to be done, etc and just take care of it. My epidural line had come loose and for the first time since my surgeon split my ribs to remove a lobe of my lung, I was in severe pain, waiting in my hospital bed for assistance. Just then, an acquaintance (not even a friend) popped in unannounced and uninvited. She was the girlfriend of a client so I didn’t feel comfortable asking her to leave. That experience was part of what compelled me to write “Help Me Live: 20 things people with cancer want you to know.” One of the statements within is “Asking my permission can spare me pain,” and that applies to asking permission to visit. GREAT post, Kairol, and fabulous tips, especially for patients! Thank you! Shortly after I arrived home, I received a visit from my Gramma, Poppy, Great-Aunt Ruth, and Great-Uncle Wen. I could see a strange look on their faces, as they rounded the sharp corner into the room. I almost felt embarrassed for being in the state that I was and thought that a “You Get What You See” sign would be appropriate. Watching them come closer, I pictured one of those cheesy soap operas. You know, one where the sick person lies in the bed, practically dead, while people come to see them one last time. It all seemed like a soap opera, depressing, and way too dramatic for my comedic flair. I was afraid I would not be treated like “Melinda” anymore, that things would be different between me and those who I knew. But I realized, quickly, that it was the same people I love dearly, and that they had come to share their love with me. I’ve recently connected online with Melinda who left the comment above. She is in high school, a cancer survivor, ballet dancer and writer with a new book out. Even though we are more than 20 years apart in age – I kinda feel like she is my twin! I’ve heard from a lot of other people about the feeling of being in a movie or soap opera, where everyone comes to stand around your bed thinking their goodbyes in their head. I think that heightened dramatic moments like that in my own cancer experience have sometimes felt cathartic – like the over the topness of my condition was being matched by soap opera like scene around me. Thanks for your comment Melinda!